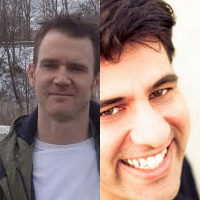 Note: Johnny & Sean will be presenting at the upcoming Author Marketing Live! Virtual event. They will be presenting a session called “Building A True Fan Base (Customers) with Content Marketing”. Read the description below. So Why Are Johnny & Sean Speaking & Why Should You Care As An Author? Johnny B. Truant is an author, blogger, and podcaster who has built a self-publishing empire. He is the author of the Fat Vampire series and The Bialy Pimps, as well as co-authoring the science fiction political thriller The Beam and the Unicorn Western series with Sean Platt. Johnny is one of the hosts of the Web’s most popular podcasts called the Self Publishing Podcast. His latest book, Write. Publish. Repeat. (The No-Luck-Required Guide to Self-Publishing Success) is a #1 best-seller in the writing category on Amazon. See their presentation. Grab your seat. Writing books is important, yes, but that’s not all you must do to grow your platform and create true fans. Johnny, Sean and Dave from the Self Publishing Podcast will explain how they’ve used content marketing like podcasts, events, and products to find new readers and create true fans.